The joint resources of Molalla and Canby are coming together for a unique Relay for Life event in June. 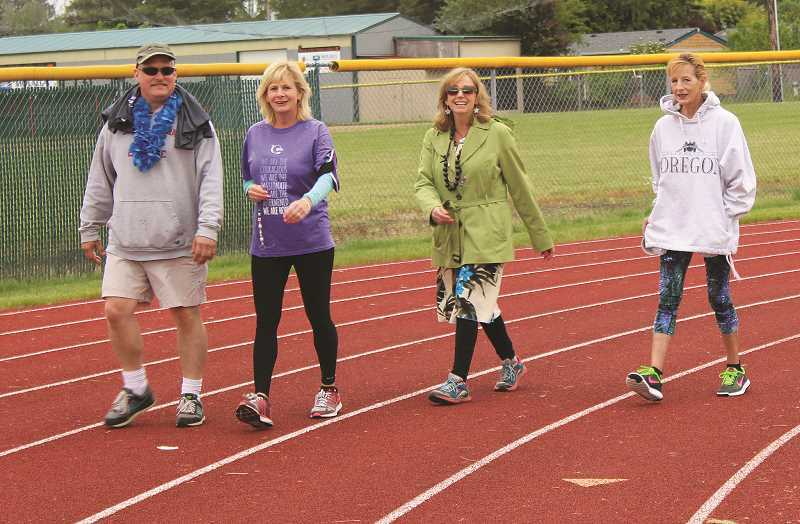 To that end, the next meeting of the Relay for Life of South Clackamas County will be held Wednesday, May 16, at 7 p.m. at Smyrna United Church of Christ (3119 S. Hwy. 170). So far, the Relay appears to be coming together nicely, according to chairperson Sharon Braden. "It has been going really well from the very start with Molalla," Braden said. "We just stared with meetings and made some decisions and decided on combining our efforts." Some of the impetus for a combined effort came from the American Cancer Society's desire to save money on expenses. Canby and Molalla aren't the only events joining forces; Sandy and Estacada, and Oregon City and Milwaukie will do joint events this year. Fortunately, said Braden, working with the Molalla contingent, who bring a similar passion for the event as Canby organizers, has been a positive. There are more committee members and the tasks needed to get the Relay up and rolling have been delegated to capable hands from both the Molalla and Canby contingents. "It really has gone very smoothly with the Molalla folks," said Braden. "Both cities are proud of their Relays, so thinking you might have to go to another city was an interesting idea at first. We'll do our one-day event this year here, then next year we'll probably go to Molalla, and they like to do the overnight event. Then, we'll be back in Canby the next year." So far, this year's Relay for Life has 17 teams signed up. Braden said she expects that number to climb to 25 or 26 by the time the event kicks off. Having a larger Relay for life event, with all the traditional activities, is a good sign for the ultimate goal of the event – raise money to fight cancer. "Canby and Molalla committee members want the same thing – for the event to be successful," said Braden. "Everyone is working really hard toward that goal." This year's relay will be Saturday, June 23, from 11 a.m. to 11 p.m. at Canby's Wait Park downtown.